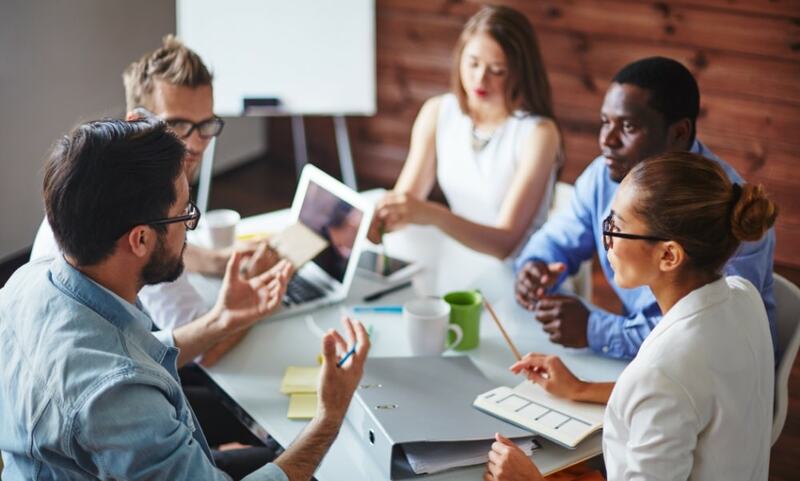 Before you dig into the brand development process, it’s essential that the top leadership in your organization is not only on board with the project, but also participating in the process. Branding isn’t something that’s assigned to someone; it’s an activity that needs engagement from the top down. Your busiest executives may not have the time to be involved in every detail, but the flow of ideas should always have them in the loop. Getting the rest of your team on board means incorporating everyone in the process--not just your marketing superstars. It might not seem like the accountants have much to say, but there’s a reason why they’re keeping the finances straight for your company and not someone else’s so find out what that is! The details of creating a formal branding book might be left to your marketing and design teams, but your entire crew should be part of the ideation and implementation. Brand champions are like your internal cheerleaders. They believe in your brand concept, what your company stands for, and what your objectives are. Because their enthusiasm is true and organic, it can be difficult to resist! This person should be in a leadership position--hopefully an executive one--who will lead by example and is comfortable coaching others effectively. Your Brand Champion knows what sets you apart from your competition, both in terms of products and services along with work environment. Her job is to maintain your brand’s image on the outside by making sure everything that faces the public is aligned with your current brand strategy. She should also develop strategies that create and maintain loyalty among the ranks so your entire crew is proud to work for the best in the business. Good Timing. From major branding initiatives to fun engagement exercises, timing is everything. Big changes can go over better during other transitions, but rarely during your peak seasons. Bringing on new leadership is usually a great time; a week before the winter holidays, not so much. Make it Easy. You might be working on a complete overhaul of your branding that your advertising and marketing teams need to stay on top of because their entire workday is wrapped up in your branding. Other team members may only have a limited tolerance for these activities so make it simple, straightforward, and easy for them to follow. Otherwise, a lot of changes can cause fatigue and disengagement. If your changes are complex or multi-faceted, consider a phased rollout: perhaps internal atmosphere first, new logo and colors next, and messaging last. Be Consistent. Make sure that internal messaging matches what faces out. Employees don’t like to feel like they’re told one thing while the public believes something else. When your branding is holistic, your team will know they’re working for a company with integrity and they will be more likely to work hard to meet goals. Be Authentic. This concept is repeated over and over for consumer-facing messaging, but it’s even more critical for internal initiatives. If you’re reaching too high or being over-the-top, you’ll inspire groans and eye-rolls rather than enthusiasm. Never forget that people are coming to work every day--something they would probably rather not do no matter how amazing your company culture is. Stay grounded in reality and make sure your initiatives ring true or your new mugs and inspirational posters will be an inside joke instead of a source of pride. When branding is done right, it stops being branding. Instead, it becomes part of your company culture and your entire team--from top executives to the youngster in the mailroom--feel the vibe and live the promise. Formal branding is necessary as it sets actionable guidelines that keep your marketing, advertising, and customer interaction consistent across dozens of touchpoints. On the other hand, don’t take the formality of it too far in your internal messaging or it’ll be just another task for your workers to complete rather than an authentic point of engagement that spills over into the public.